I'll be honest I hate this day. It's been six years since that awful day when truly evil men attacked our country and murdered hundreds of innocent people. The feelings of shock, helplessness, grief and then intense anger I still remember. I have never felt as angry or was filled with as much hatred towards anyone as on that day. Like many people it wasn't just the senseless brutality of the attack on this country that brought all these emotions to the fore, it was in knowing one of the victims and seeing his loved ones left alone because of what those cowardly bastards did. It has been a long hard struggle since that day, as individuals, families and as a nation in putting our lives back together and moving forward. The fight against the evil men who started this war continues. 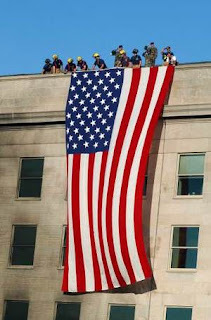 We've seen many of our people respond in extraordinary and moving ways since even before the rubble of the Pentagon and the Twin Towers finished smoldering. Heroes great and small, some wearing uniforms and others not, have shown the world the kind of mettle this nation is made of. We've endured the continued sorrow of loss here and abroad in this struggle that we did not want but have been forced to bear. Some among us may faltered since that day six years ago while many of us have not, remaining steadfast with a determined resolve. So while I truly do hate this day it is important to stop and remember what and whom we lost on that day, as well as reflect upon what remains to be done for victory over our foes. Yes, victory. May God keep the souls of those who have fallen, comfort their loved ones left behind, and continue to bless our beloved homeland the United States of America.